Hold the phone! The most super of all video game plumbers makes his debut on (gasp) iOS this week with the rather lovely Super Mario Run (check out our full thoughts on the game in our full review). Since we've played a boatload of it already, we thought it'd be swell to key you in early on how to make the most of your time with the game. 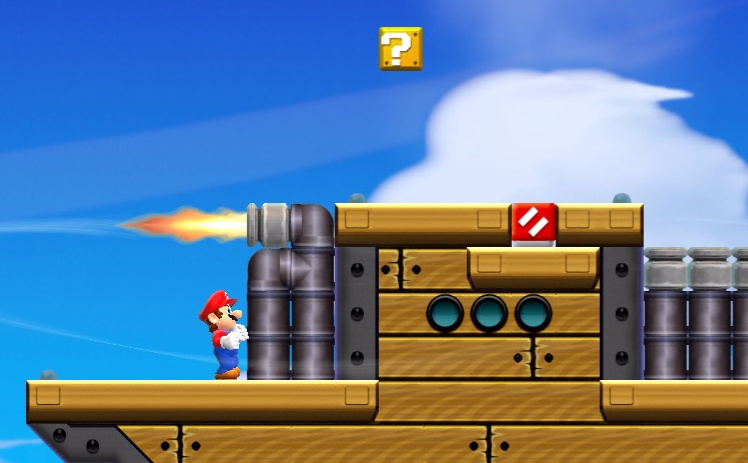 Here are our top tips for mastering Mario's dashing new adventure. Are you sitting comfortably? Then let's begin. Just like the traditional Super Mario games on consoles, this mode sees you dashing through six different worlds each comprised of four stages each. Here the goal is to collect coins and post the best score, but you'll also want to grab the five pink coins on each level. 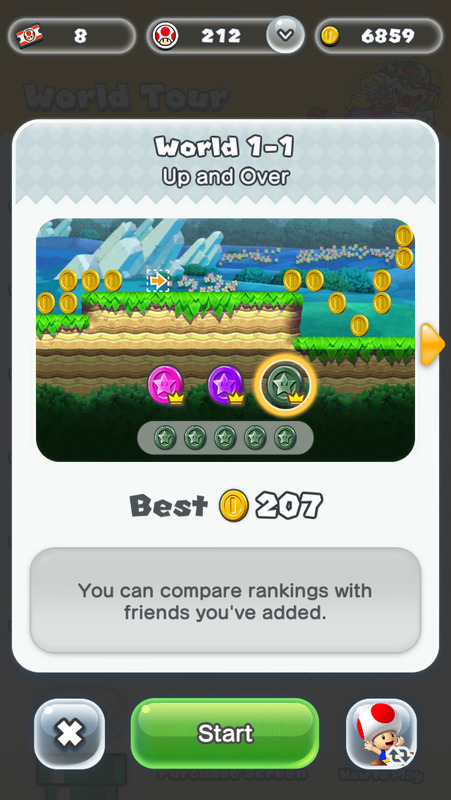 Once you have them all you unlock a new coin layout, with five purple coins to collect — this time in harder-to-reach places. Get all of these and it's onto the black coin challenge. Only when you've completed all three can you truly say you have beaten Super Mario Run's World Tour mode. Once you've finished with the World Tour mode, this is where you'll be spending the majority of your time. In Toad Rally you compete with other players (well, their ghost AI at least) to see who can grab the most coins in a timed run. Performing well in this mode unlocks the coin rush power which temporarily increases the amount of coins available to collect, thereby amplifying your chances of winning. Performing exciting leaps and jumps also earns you the adoration of the various Toads watching, and these are added to your kingdom if you emerge the winner at the end of the run. Each attempt costs you a Toad Rally ticket, and you should be aware that losing means you have to sacrifice a small number of your own Toads. This mode serves as the hub of your Super Mario Run experience. From here you can see the benefits of your Toad Rally performance, with the more Toads you earn expanding your castle. You also gain access to more structures to build; these range from shops which give you special items each day (such as Toad Rally tickets) to rainbow bridges which allow you to expand your kingdom. Remember to have a good look around your kingdom each day as some of the inhabitants may have special rewards for you. Mario only has a few moves he can pull off, so it's important to know when to bust them out and how to string them together. Controlling Mario is dead simple but there's surprising depth here for a one-button game. Mario automatically runs to the right at all times — you can occasionally send him in the other direction (e.g. if you jump off a wall to the left), but once he's found his footing will resume his journey to the right. Small enemies and obstacles are automatically vaulted, although can be dispatched or interacted with if you land on them. Mario will also skedaddle over single gaps in the floor without you having to do anything. As for manual controls, tap to make Mario jump. The height of the jump is dependent on how long you hold your finger to the screen. Once airborne, tap again to execute an air spin and extend the apex of your leap. If you're near an enemy when you perform the tap, Mario will take them out with a special spinning attack. Mario can also jump off and slide down walls, and climb up ledges if he lands on one. It's possible to combine these animations with taps to perform acrobatic jumps which come in handy when impressing Toads in Toad Rally. Finally, you can control Mario's jump by sliding your finger to the left of the screen. This stalls his momentum while he's in the air, allowing you to cut short your leap and reach tricky, low-down areas. Super Mario Run is all about finding the best line through the stage. It's tempting to tap and get Mario out of the way at the slightest sign of trouble, yet sometimes holding steady is the best strategy. For example, if you see a line of Goombas coming your way, you might be tempted to jump on their noggins to take them out. However, doing so might introduce an element of elevation to your route that changes your direction and blocks off a cache of coins or a special item. Sometimes the best course of action is to take no action at all. 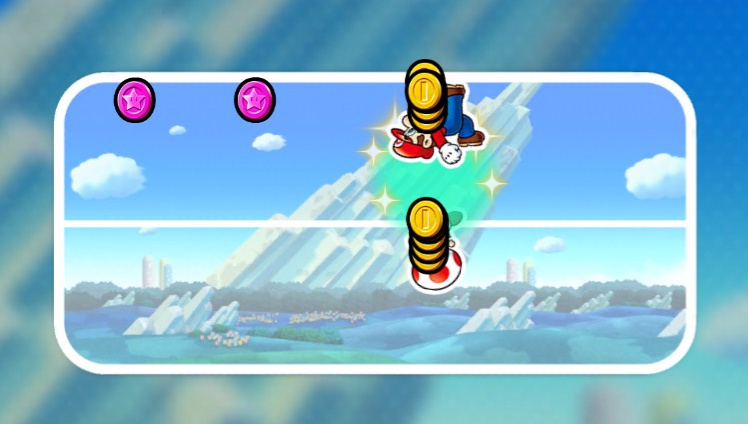 The Coin Rush meter in Toad Rally is filled by collecting coins and pulling off daring moves, like taking out enemies or doing well-timed air spins. If you want to fill it quick to help boost your score, go nuts and play like a parkour master. Also, be on the lookout for invincibility stars in this mode — these can be used to keep your chain going for longer as you don't have to worry about hitting enemies. Getting hit by an enemy or falling off the bottom of the screen doesn't mean game over — Mario becomes encased in a bubble which slowly floats backwards through the stage until you pop it and restart your daring dash. However, you can activate the bubble whenever you wish by tapping the icon in the top-left corner of the screen. 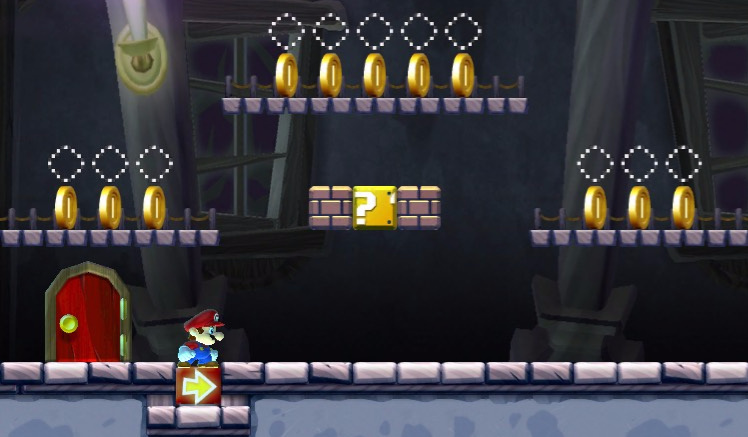 This can be used to your advantage; it allows you to backtrack and pick up coins you have missed or take an alternative route through the stage. The natural limitation to this is that you only have two bubbles per stage, so use them wisely. Mario may be the headliner but he's got five friends along for the ride to unlock. Each one can do what Mario does, plus an extra ability that might come in handy depending on what you're trying to accomplish. Toad is a freebie. Connect your My Nintendo account and unlock him immediately. Peach joins the fray once you rescue her in Tour mode. 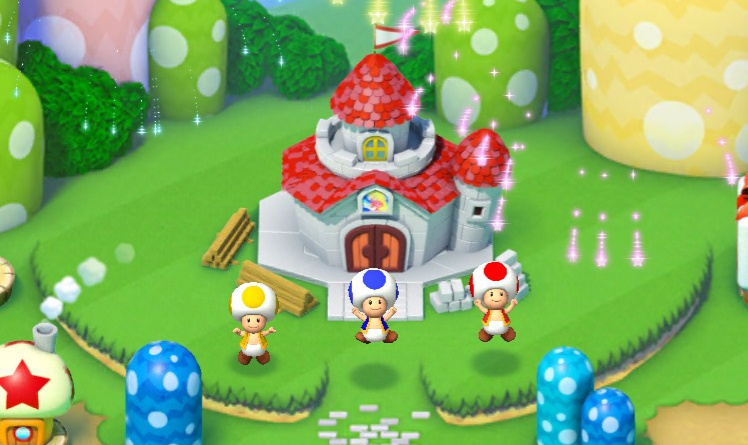 Luigi, Yoshi, and Toadette are available once you build their homes in your Kingdom. Their homes are available to build after amassing certain amounts of coloured Toads by playing Toad Rally. Each has a special skill; Yoshi can float upwards in the air briefly which makes him a good choice for reaching high platforms, while Toad is incredibly quick. It's worth noting that many of the bonus characters lack Mario's ability to consume mushrooms and grow in size, and that means they can only withstand one hit. You have been warned. Kingdom Builder mode starts on a single screen but it's possible to expand the amount of land you have to build on using a special item, the rainbow bridge. This is unlocked when you've collected the correct number of colour Toads in Toad Rally. Other buildings are accessed this way as well — to find out exactly which Toads you need, tap on the building. One of the great things about the Super Mario series is how friendly they are to repeat play. Whether you're going for a high score, a speed run, or a simply going back to grab all of the special coins, you're usually not "done" with a stage after the first time through. Super Mario Run takes things a step further by actually modifying stages the more you play. In the standard Tour mode, each stage has five special coins to collect — grab them all and another set of five will unlock that'll prove more difficult to grab. 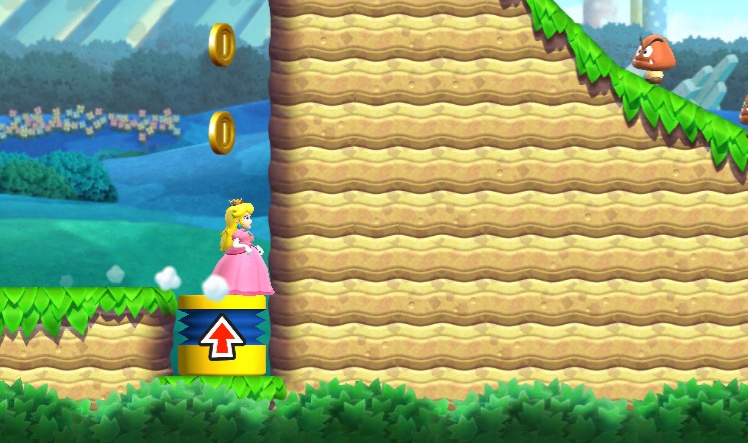 Sometimes that means special coins are placed in areas requiring elaborate acrobatics, and other times the stage itself will contain new obstacles to overcome. In the Toad Rally mode, you'll be challenged to complete variants of the same stage each time you play — which is great because you'll need to play a lot of Toad Rally in order to unlock characters and special items for your Kingdom. Do you have any tips you'd like to share? Post them in the comments below. I hope they add Waluigi. Shy Guy might be a good option as a character. I didn't even know Peach was a character you could play as. Oh, and I have a question. How do you switch characters? I got Yoshi and I can't switch. That is just mean. Stop with the posts about this game until everybody has the game! @setezerocinco That's like saying to stop posting general Smash 3DS tips when you only have a Wii U.
I do not care about Smash tips, so this is not a problem for me. As another tip, in Toad Rally if you think you're doing pretty bad compared to the other person (like if they got a Star and you missed it, or you're having an off moment and keep falling into pits), pause and quit before time runs out. You won't lose any Toads, and your Toad Rally ticket that you spent to play the round returns to you. I can see that being patched out sooner or later, though. I have a tip too: don't waste your money on this game if you don't like mobile games. Toad Rally is a blast! And I love the parkour reference...that's pretty much what you have to do to work up to coin rush. @G-Boy Have you played it? It's a blast. Don't be so hard on it if you're just assuming it's a shallow mobile game. @Mario_maniac Are you sure? There's a warning that you'll lose some toads if you quit, and I think I remember my toad count decreasing the times when I did that. I'm glad that losing a Toad Rally doesn't affect the number of Toads you already collected for unlocking items. (Say you have 50 Green Toads, and lose 4; your Kingdom will have 46, but any item you want to unlock will still say 50/___). @nab1 The only warning I saw was that we'd lose the Toads who came to support us for that round. I checked a few times and my Toad levels didn't decrease, but will have another looksie now. Edit: Well hey, guess you were right — my Toads all decreased by one when I quit an airship level, except for the Yellow Toads. Still, I'd rather lose one of each than a whole bunch of each. Edit 2: Tried it again in a Red Toad-only stage and the count didn't decrease that time for me. I don't know what formula they're using but it seems a bit random. How about a video showing Mario's moves. Might be more practical. If this game will be treated as good as MK8 and SMB4 were, OMG. I really like this game, and its challenge lying in its simplicity is far more exciting than Rayman (and I do really love Rayman, I have bought these games both on iOS and WP8.1). I got to say this game is more addicting then I imagined. I'm really enjoying it.